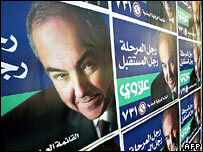 A leading Sunni Arab politician has been shot dead in Iraq, two days before the country's general election. Iraqi Free Progressive Party leader Mizhar Dulaimi was killed while campaigning in western Iraq. Iraqis living abroad have already begun casting their votes. Expatriates have until Thursday to vote in polling stations in 15 countries. Meanwhile, four US soldiers were killed by a roadside bomb in northwest Baghdad, the US military said. 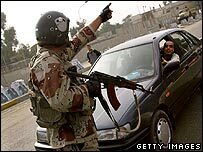 Mr Dulaimi was shot dead in his car in the restive city of Ramadi, in the western Anbar province. Three of his bodyguards were wounded. He had appeared on television the previous night urging Iraqis to take part in the elections. Many Sunni Arabs are standing in the election after their community largely boycotted the 30 January vote for a transitional assembly. But Sunni candidates have been among the groups most targeted in pre-election violence, correspondent say. Al-Qaeda's branch in Iraq and several other extremist groups have warned people not to vote, describing the process as a "devilish plot". A spokesman for the Independent Electoral Commission of Iraq, Farid Ayar, said the vote conducted outside Iraq was important. There are an estimated 1.5m expatriates eligible to vote. A five-day public holiday began in Iraq as security tightened ahead of Thursday's poll. Iraqis will be able to vote in Australia, Austria, Canada, Denmark, Germany, Iran, Jordan, Lebanon, the Netherlands, Sweden, Syria, Turkey, the United Arab Emirates, the UK and the US. "We are making every effort to ensure the elections are honest, because any problem will have repercussions on the ballot in Iraq as well," he said. The chairman of the Iraq Out-of-Country Voting Program hoped there would be a higher turnout than in January's election, when 265,148 expatriates voted. "We are expecting a greater number of voters because parties who boycotted the [January] elections are participating," Hamdiya al-Husseini said. The BBC's correspondent in Tehran, Frances Harrison, says the people voting in Iran are mostly Kurds or Shias, who have lived there often for a quarter of a century, pushed out by Saddam Hussein. Many of them say that they want to go back to Iraq and they hope that this election will bring the security they need for them to go back, our correspondent says. On Monday, Iraqi soldiers, hospital patients and prisoners cast their votes.